The hardest thing about this bread is deciding you want bread 18 hours before you actually want bread. Seriously. I've been making this bread for a few years now, and since first reading the recipe, I've monkeyed around with the recipe a lot. The basic concept has stayed the same - very wet dough cooked in a very hot, covered dutch oven. 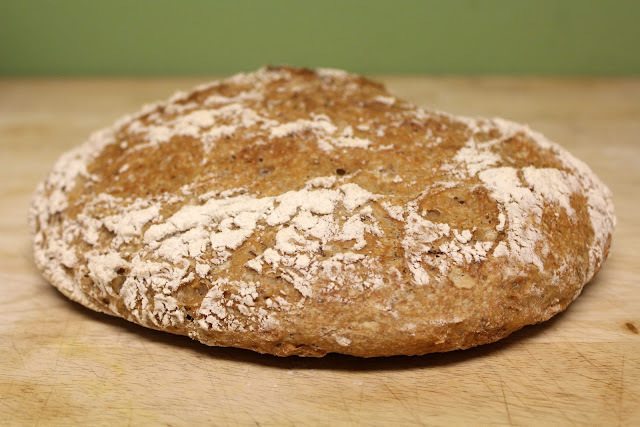 The bread ends up crusty on the outside, with a chewy, soft crumb. I add whole wheat, flax, oatmeal, sometimes rosemary or kalamata olives. It's very adaptable. 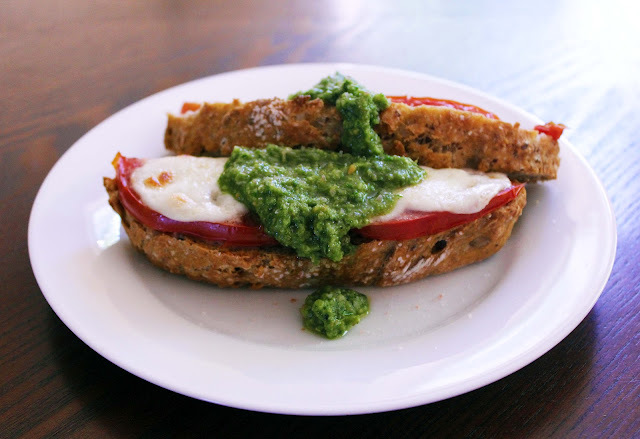 Today I made some pesto, and broiled slices of bread with tomatoes and mozzarella. Voila! Caprese Toast! Combine all ingredients except the water and stir to mix everything together. Stir in the water adding a bit more if needed. The dough should be very "shaggy" and wet. It should look like the consistency of oatmeal. Cover the bowl and let this mess sit in a warm spot for 12 - 24 hours. To keep a warm place I microwave a dish towel for 20 seconds and then put the bowl on top of the dish towel in the microwave (don't microwave the dough!) For the timing on this, I usually start a batch of dough before I go to bed and bake it the next afternoon... it's generally about 18 hours that it sits. When the dough has risen and is bubbly all over, take another 1/2 cup of flour and roll the dough around a few times covering it in the fresh flour. I like to do this on a cutting board because it is sticky. The very wet dough will soak up a lot of flour, so use quite a bit. Then let the dough sit for an hour. Preheat the oven to 450 with a large, covered dutch oven in the oven while it heats up. Let the pot heat up for about 30 minutes. Carefully take the very hot pot out of the oven and put the dough in. It will still be a wet ball and moving the dough into the pot has to be a quick deal. Your loaf will be "free-form." I like to sprinkle it with kosher salt at this point and let the salt bake into the crust. Bake covered for 30 minutes. Uncover the pot and reduce heat to 425 and bake for another 15 minutes. Enjoy fresh bread smell for hours to come. Combine everything in a food processor (I used a Magic Bullet for this tiny amount) and pulse until combined. Keep pulsing until you reach the smoothness you like. I generally make a big batch of pesto (quadruple everything) and freeze what I'm not using right now in 1/4 cup quantities. Pesto is great on pasta, chicken, tomatoes, pizza... it's lovely stuff and it freezes wonderfully! Totally making this tonight/ tomorrow. Remember when you told me about this recipe like 3+ years ago. I was impressed at the time but I was single and not nearly as "housewifey" as I am now, so the reality of making a loaf of bread... well... it just wasn't happening. Now, though! I have been looking at bread recipes lately a lot. I need a good one so that I can add to it when needed like Garlic or cinnamon raisin but mostly I want it to be healthy. And this one is! Thanks for posting! :) "Housewifey" LOVE IT!! This bread is the best - you're going to want to make it all the time, but that's OK, because bread is the best! !